While more and more IT organizations have PMO project management in place nowadays, the percentage of IT PMOs which are terminated after just a brief period of time is far from encouraging. In fact, numerous studies suggest that the lifespan of most PMOs is between 3 to 4 years if you are lucky. This scenario can have several causes; however, a common reason is the lack of communication of the value of the PMO to the organization. This is not to say that PMOs do not deliver value! Quite the opposite: you might have the best PMO in the world, yet, if you are not continuously demonstrating that value, how do you expect others to see it? In an era where not to be visible is not to exist, the same logic applies to PMOs: pic or didn´t happen! How to show the value that PMOs bring to organizations? Different options are available, however, one that can put you right at the center of the conversation is a PMO KPI Dashboard. After all, we in project management all love dashboards, right? The PMO KPI Dashboard uses the fundamental principle that you can only manage what you can measure. To that end, it follows the concept of Balanced Scorecard formulated by Kaplan and Norton and combines a set of key performance indicators (KPIs) that enable the PMO team to measure its performance. 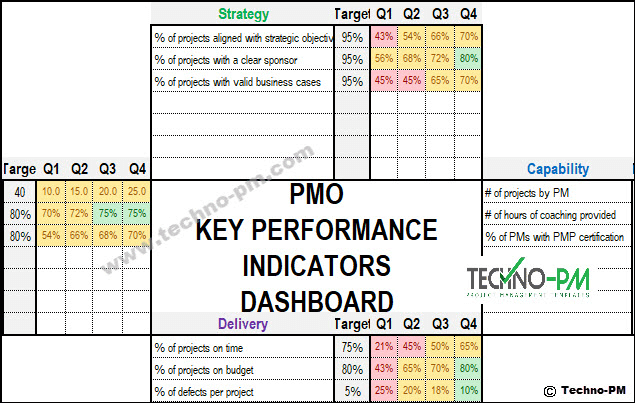 To offer a holistic view of the value generated and extracted by the PMO, the PMO KPI Dashboard is formed of four key dimensions. Metrics relating to the delivery of the (portfolio of) project(s) are usually where most PMOs start by reporting on – the traditional iron triangle of project management. This dimension includes KPIs such as % of projects delivered on-time, % of projects delivered to budget, or % of defects per project. This is typically how the health of the portfolio will be tracked. The strategic dimension of the dashboard measures the contribution of the PMO in ensuring that the portfolio of projects aligns with the strategic objectives of the organization. 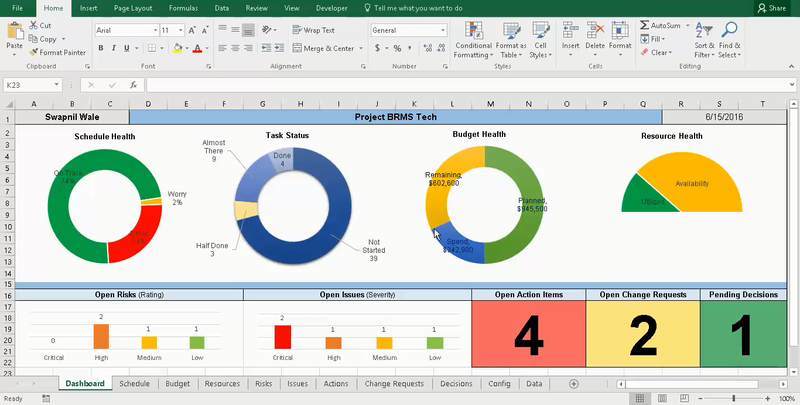 Examples of metrics in this dimension are the % of the project with solid business cases, % of projects stopped at stage gates or % of projects prioritized with the support of the PMO. PMOs have the responsibility of enabling project management capabilities in the organization, and that is exactly what this dimension intends to measure: to what extent is the PMO performing in supporting organizational capability development. 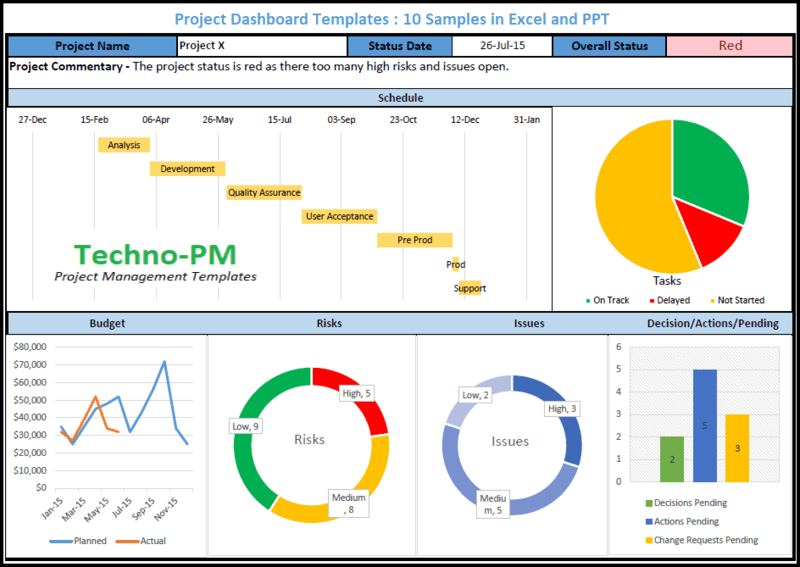 KPIs to track include the number of hours of coaching provided by the PMO or the % of professional certified project managers vs accidental project managers. The fourth dimension of the dashboard relates to the performance of the PMO team, that is, metrics that indicate how well is the PMO performing as a team and as a service provider. KPIs in this dimension include a satisfaction score by the PMO customers, number of hours of training invested in the PMO team, or the number of projects supported by the PMO. While most PMOs offer some sort of performance reporting, this tends to be exclusively linked to delivery targets, the time-cost-quality objectives of project management. However, by focusing just on these aspects which are mostly outside the control of the PMO, you might be missing an important trick. The PMO delivers so many more services, why not measure these too?! It’s easy to forget how much one does and get distracted by the day-to-day operations but make value explicit and let everyone see it. You are probably doing more than you thought! Clearly define what KPIs to measure: like with objectives, KPIs should follow the KISS principle, keep it simple. It’s better to have few but relevant than plenty but irrelevant: you can list dozens of measures but which are the ones that would really make a difference? Focus on what is meaningful, not for you but for your PMO customers. Use actionable KPIs: if you can’t do anything about a certain KPI, why even bother measuring it? Work just with metrics your PMO can influence or action. Be realistic in your targets: based on your existing baseline and organizational project management maturity, define an attainable target for each KPI that enables people to be motivated to achieve it within known constraints. Discuss it with the PMO Sponsor: make the Sponsor accountable and part of the conversation as the PMO team and the PMO Sponsor might have different expectations over the same KPI. Monitor and correct: agree a reporting frequency and assign an owner to the measurement activity; monitor how the KPI is performing over time and apply corrective actions where needed. Don’t be afraid of red: it’s OK to start with a not-ideal performance or to have better months than others. Be humble and remember to focus on the journey rather than a specific point in time. Tell a story: numbers are important but what captivates people’s imagination are stories. Use data gathered over time to uncover patterns, provide insights and support decision-making. 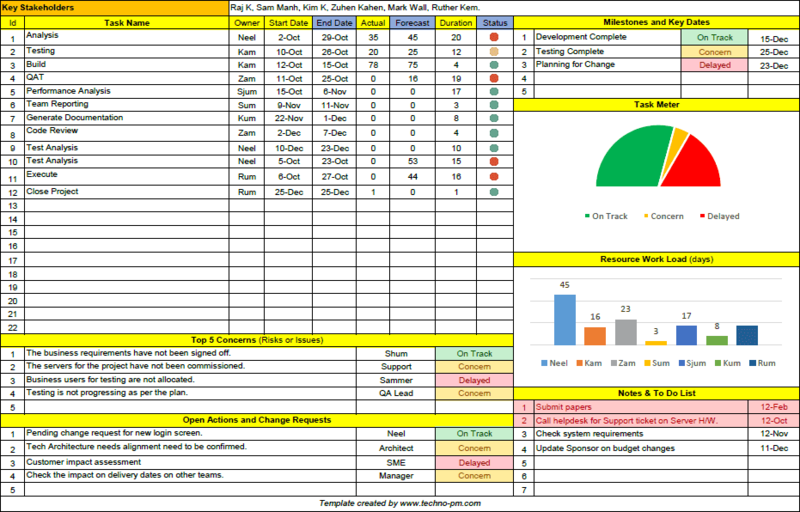 Share it: make the performance of the PMO a collective effort by sharing your stats with the wider organization. This will allow the PMO to better manage expectations, communicate the extent of services provided, as well as create a sense of action and demonstrate the PMO value. Most PMOs fail not because they are not delivering value but because they are not communicating it. The PMO KPI Dashboard offers a simple yet effective way of demonstrating the value a PMO brings to the table. Be brave in your PMO: you are good at what you do, brag about it!